Five on Friday withdrawal…it’s a real thing, people! 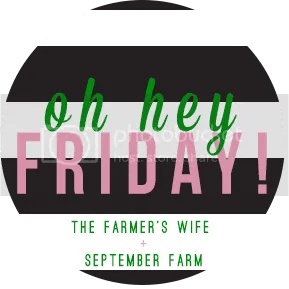 I’ll jump back on that wagon when it returns after a summer break, but today I’m pretty excited to join Karli & Amy for “Oh Hey, Friday”. Same idea, same rules…so here goes! I think I found my new favorite HGTV show while on the treadmill at the gym today. It’s called Fixer Upper and it’s all about a cute little husband and wife duo in Waco who remodel homes together. I love Joanna’s style and I kind of want her to come decorate my new house…and be my best friend. In completely unrelated news, I was once a California Raisin for Halloween…paper mache costume courtesy of my crafty dad. The jazz hands though? That was all me. We met some friends at the petting zoo/farmstead this week and enjoyed the perfect 70’s weather in KC…in July. I’ll take it! I don’t know how she does it, but Arden has a knack for surrounding herself with all boys. Uh oh! This girl loves her ranger rides…even when they consist of doing chores! We close on our house in a week. Here are a few updates from my daily recent visits. The cabinet hardware is being changed to satin nickel, but I love the backsplash…not to mention the little photo-bomber in the corner. Well that’s all folks! Hope you have a fabulous weekend!!! 25 Weeks Down–15 To Go! I discovered Fixer Upper yesterday too! Love her decorating style and they are a cute and hilarious couple. Congrats on the house and have a great weekend! We love going to the Farmstead with you guys! Can't wait to see more house pics, it's beautiful! Fixer upper has had marathons lately and I can't get enough! Also I love the carpet- and do I see railings?!?? The house is coming along so nicely, it's gorgeous!!!! We have had some much cooler weather here in IN this week too, and my pregnant self is loving it!!! Too bad it's going to be hot, hot, hot again next week! You have my dream kitchen! We are in the process of buying a new home and looking for one to redo the kitchen! I am definitely going to pin some of your pictures for my inspiration! I love your house!!! so beautiful!!! can't wait to see more as you move in! LOVE the living room built-ins too! I love Fixer Upper!! Such a great show! And I'm loving the progress pictures of the house, looks amazing! Your new house looks GORGEOUS! Love it. And I keep hearing about this show. The interiors she does are beautiful. I need to remember to record it. oh my word.. i am OBSESSING over your kitchen. So, so gorgeous Vanessa!! Can't wait until you are all settled in!! Your house looks fantastic!!!! Its beautiful!!! Your house is amazing!!! Love the lights over the island.. where did you find them? You house, amazing!!!!!!! I'm in love!! HGTV use to be my jam until all the shows changed to boring ones, that and the Food network. Too many competitions not enough simple homes and foods. I'll have to check out this one! hahaha to the cali raisin, that is amazing! One more week! It is coming along so nicely can't wait to see you turn it into a home! Your house – I'm in love with all of it!! I'm straight up obsessed with Fixer Upper! I want them to fix up a house for me so badly! And your house…oh my word…it's drool worthy!